When I had a look at the plot however, I came out a bit apprehensive; I'm not particularly fond of marriages in the middle of the story, I've said it probably thousands of times, and I was worried that the heroine would have been the overly-seen tomboy female protagonist, who knows how to fire a gun and ride astride (which I generally like but from a series such as this I was hopping for something more unique). I should have known better...the heroine, Sam/Allison is indeed unique. She is a bandit, and a murder. 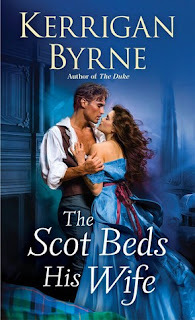 Gosh I adore how Byrne is not politically correct with her characters...her protagonists are those that would be depicted as antagonists in others' historical romances. I LOVE. Moreover, in The Scot Beds His Wife, very interesting things are said and which will be hopefully developed in the future novels; apart from Alison and Callum's love story which I cannot wait to read, there is the Rook, who till now had been only mentioned but who here, being more relevant to the plot, has given the reader a lot to speculate about regarding himself and his relationship with Dorian (The Highwayman). I WANT TO KNOW EVERYTHING ASAP. All that said, I find myself partially in agreement with those who say that, compared to other novels in the series, this misses something that catches the reader's heart, soul, mind...bringing to hours of longing because you would have wanted to read the story slower so to have more time to enjoy it...and then you hope to find something as good to read as soon as possible and then you don't and you have to wait and wait and wait (I think I'm describing an addiction...); now, I really liked The Scot Beds His Wife, to be blunt I think it is better than the previous one, The Duke; however, since we like lists, I consider the The Highwayman, The Hunter and The Highlander on another level, a stellar one. BUT I will suggest this novel, with the rest of the series, to everybody, because I truly believe the Byrne writes amazing stories, also those that are less amazing than the others, still make great readings.